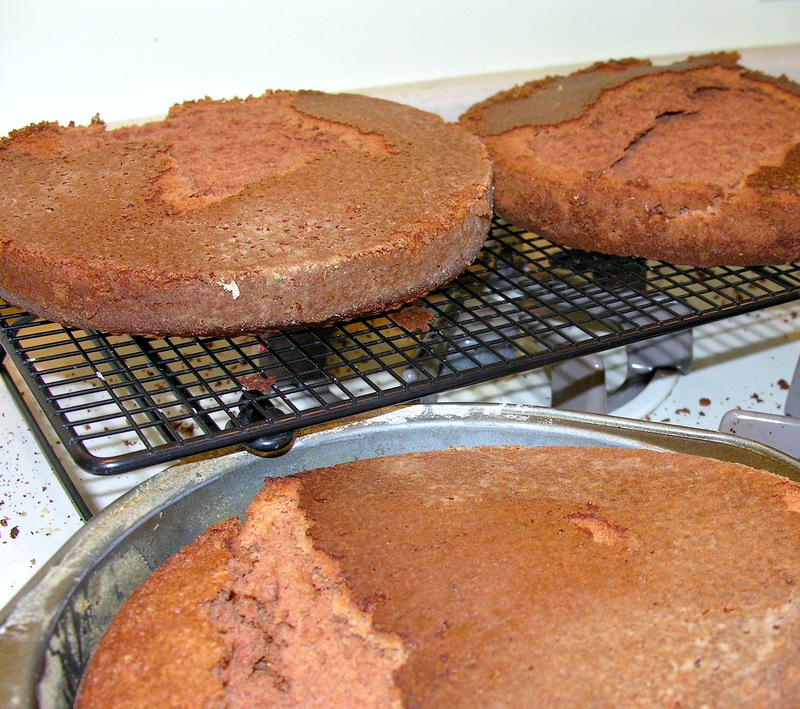 The cake is incredibly time consuming in my opinion….MUCH too time consuming for a blog called EASYbaked anyway 🙂 ….I made this crazy from-scratch cake and had all three pans stick (I should have added a circle of parchment paper to the bottoms….) and fall apart. 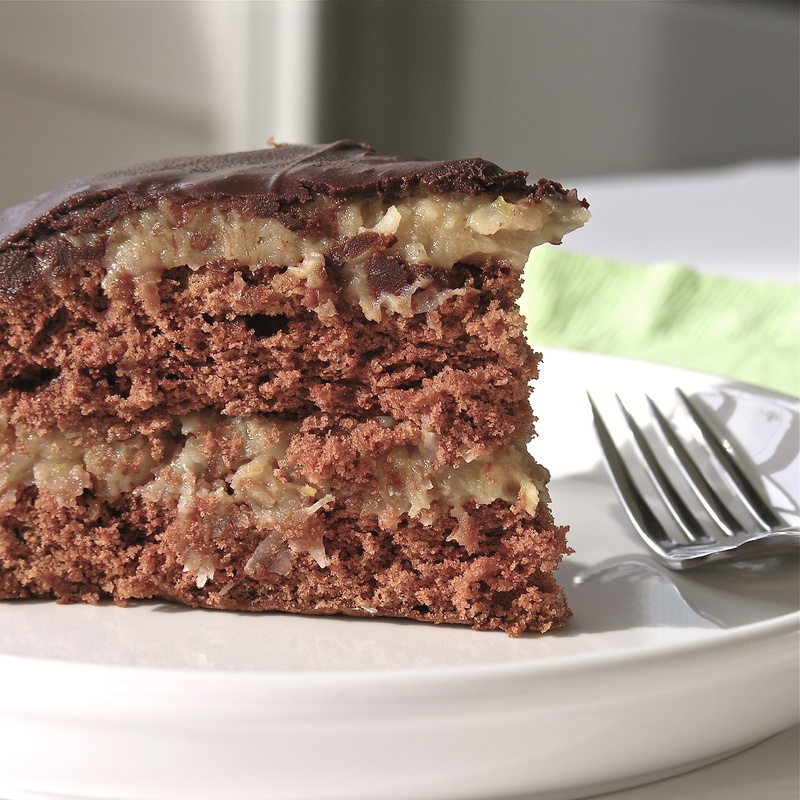 The recipe involves separating eggs and whipping into stiff peaks and melting german chocolate and adding buttermilk and cake flour…….yeah- buy a german chocolate cake mix– the cake was good- probably one of the best scratch cakes I’ve made- but it was not quick or easy….your call 🙂 . The icing, on the other hand, was TO DIE for! 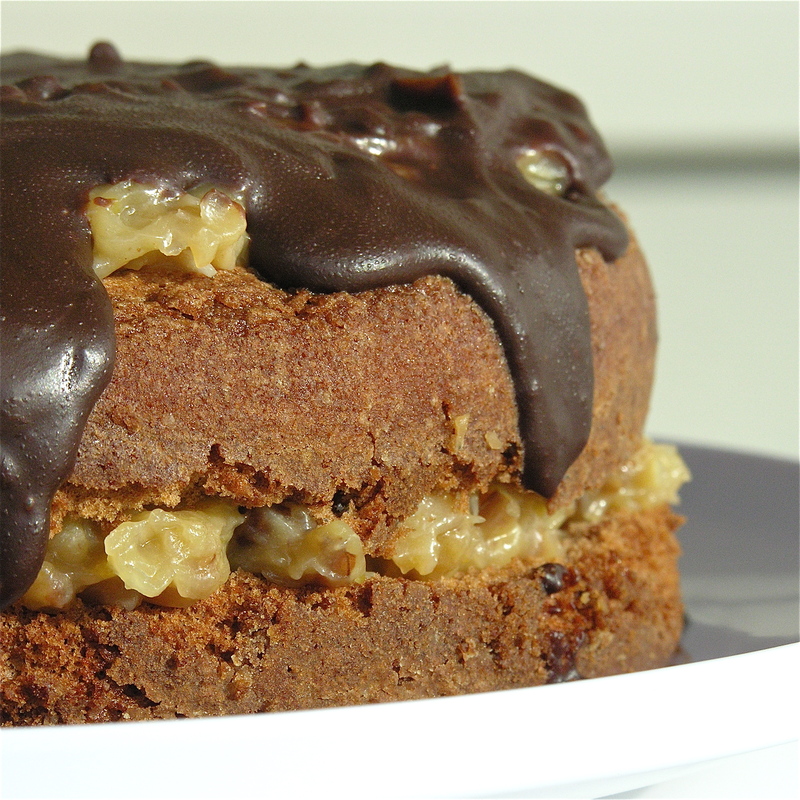 I will never buy German chocolate frosting again— easy and quick and soooooo good!! so…. 1 German chocolate cake mix (with oil and water to make according to box) -or be brave and make it from scratch (it is really yummy)- remember the parchment paper!!! FROSTING : In saucepan combine sugar, evaporated milk, butter and egg yolks. Cook over low heat (stir constantly!) until this thickens considerably (took me about 8 minutes). Chill until thick enough to spread. Slice each cake in half, forming 2 layers. GANACHE: Heat whipping cream in a small saucepan until bubbling at edges (about 30 seconds). Add chocolate chips, cover and allow to sit for 5 minutes. Stir until smooth. Pour over top of cake and allow this to drizzle down the sides. Posted in Cakes and tagged cake, chocolate, coconut, dessert, german chocolate, german chocolate cake, layer cake, pecans. Bookmark the permalink. This looks so good reminds me of my childhood during Christmas. have to make this during the holidays. German chocolate cake used to be a dessert that you would see so often at a restaurant when I was growing up in Texas. I think the cake was so popular because Texas has so native pecan trees. To me, it is one of the most decadent cakes that you can eat. Sorry you had problems with it sticking but it still looks delicious to me. Thanks Karen! I’m going to have to try it again…it was so good with 2 layers that it would have to be even better with 4! In one of my pastry classes we use a similar German Chocolate Cake Icing and we recently made a batch and used it as filling for Danishes! It was SOOOO good. When you make this icing from scratch you’ll immediately want new ways to use it b/c it’s super yummy! Oh it would be SO good in danishes….I’ve discovered that truth about a lot of different frostings and fillings– find one thats yummy and the sky is the limit!